The legendary Kenwood KD-500 / KD-550 direct-drive turntables are classic decks from an era when things really were built to last. Indeed, if decks like the KD-500 / KD-550 with this level of custom engineering were built now, they would cost many thousands of dollars. The Technics SL-1200 is a classic example – it’s been reissued and costs literally thousands! This is just one reason I love these Kenwood decks. I’ve written many Kenwood KD-500/550 articles, and don’t forget to check out my articles on the Kenwood KD-600 / KD-650, which are just about the best direct-drive decks from Kenwood, apart from the legendary L-07D. The only difference between the KD-500 and 550 is in the tonearm. The KD-500 came without an arm from the factory, while the 550 was supplied with a Kenwood arm. The idea was that you would then fit your favourite Grace G-707, or perhaps an SME Series 2 or 3 to the KD-500. Nothing new from Rega or Pro-Ject can even hope to come to close the level of precision you see in a deck like the KD-500. The Japanese just do this stuff properly, nothing spared. A modern Rega and a KD-500 or 550 are in different universes, no matter what the salesperson tells you. Trust me, he or she hasn’t owned one of these and remember – I’m not selling you anything here! The deck in the pictures here is a KD-500 and therefore has a non-Kenwood arm. These Kenwood direct drive decks have a chassis made from Kenwood proprietary ARCB synthetic granite. The motors are a custom, high-torque design, the tonearm on the KD-550 is also a Kenwood custom design. More on this custom engineering below. 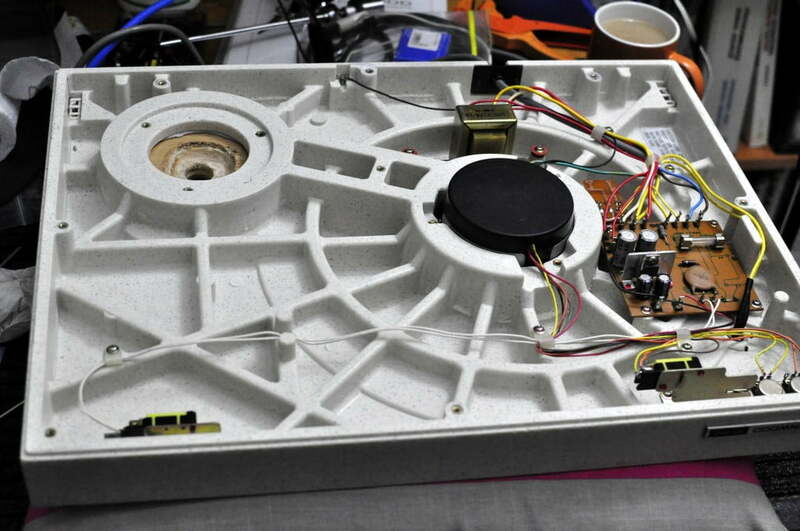 This is a good plan view of the underside of the Kenwood KD-500 or KD-550. At the top left, you see where the tonearm sits. The black thing in the middle is the underside of the servo-controlled direct drive motor. 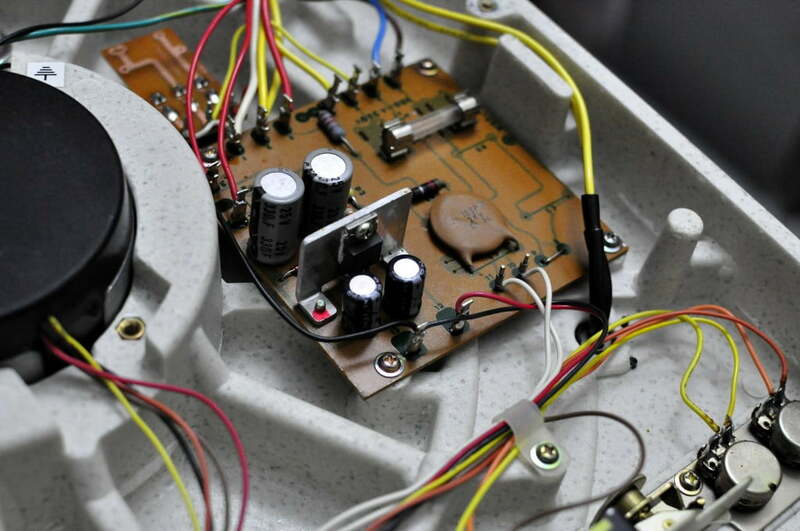 You can also see the mains transformer and power supply circuitry situated around the motor. …Which we see here. This is a close up of the power supply circuitry. Note that these capacitors were still good, thirty years on. I am not generally a fan of changing capacitors “for good measure” unless they are a real pain in the bum to get at. 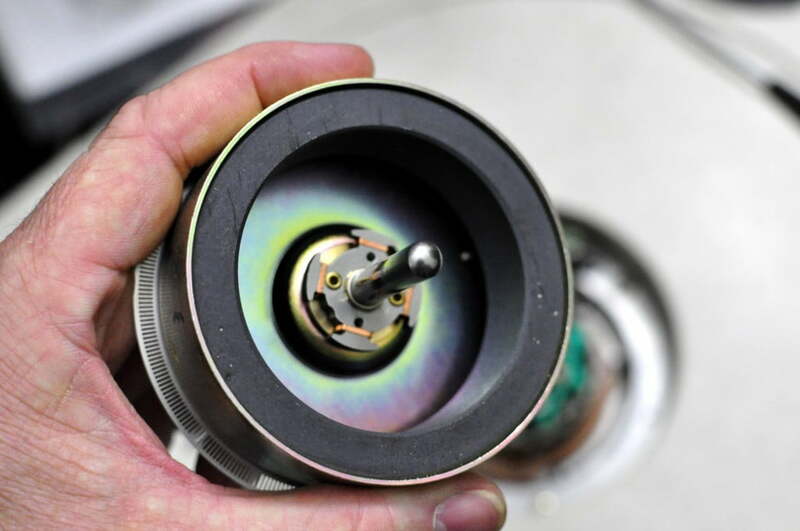 The KD-500 / KD-550 feature custom-manufactured direct drive motors. 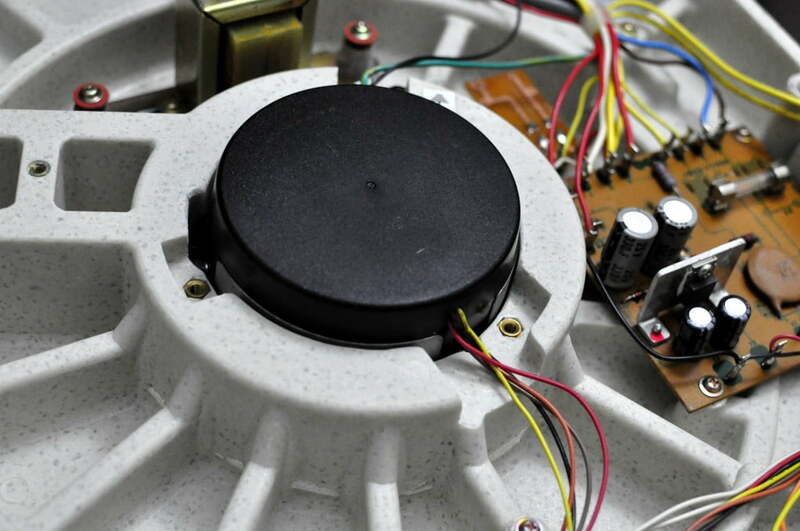 This is a world of precision apart from the puny AC clock motors you find in Rega or Linn decks. This is exactly what the Japanese do best – impeccably well-designed, well-executed custom engineering. No belt-drive deck can even hope to compete with the speed and pitch stability generated a direct-drive motor like the one found here. You can tell as soon as you play a record, despite what all the belt drive fanboys will tell you! This is the underside of the motor. Note the awesome synthetic granite base, with brass threaded inserts for screws and fasteners. This was a proprietary Kenwood material and one which they used in all their good gear. And here, with the rotor removed, to enable lubrication of the bearing. This is what you see when you open the lovely direct drive motor. 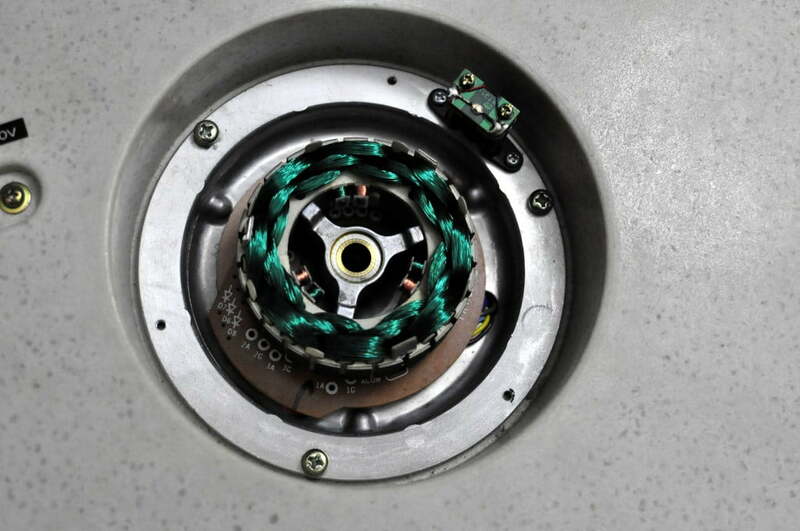 The stator and windings, inside a steel can, bolted down to synthetic marble plinth – note the speed sensor at 1 o’clock. Kenwood describes these motors as not requiring lubrication. They didn’t, in the normal lifetime of a few years, expected at the time of design. They do now! Another area where the Kenwood KD-500 / KD-550 excels is the chassis or ‘plinth’. This is not a plinth made of wood or chipboard like many other decks. Instead, the Kenwood plinth is made from a synthetic marble, or granite, called ARCB. ARCB is a resin impregnated composite. It looks and feels like marble and is a material Kenwood became well-known for. Many customers still whisper about the “marble turntables” when they see Kenwood decks here in the shop. Possessing excellent strength and damping properties, ARCB can also be moulded into complex shapes, like these KD-500 / 550 chassis for example. 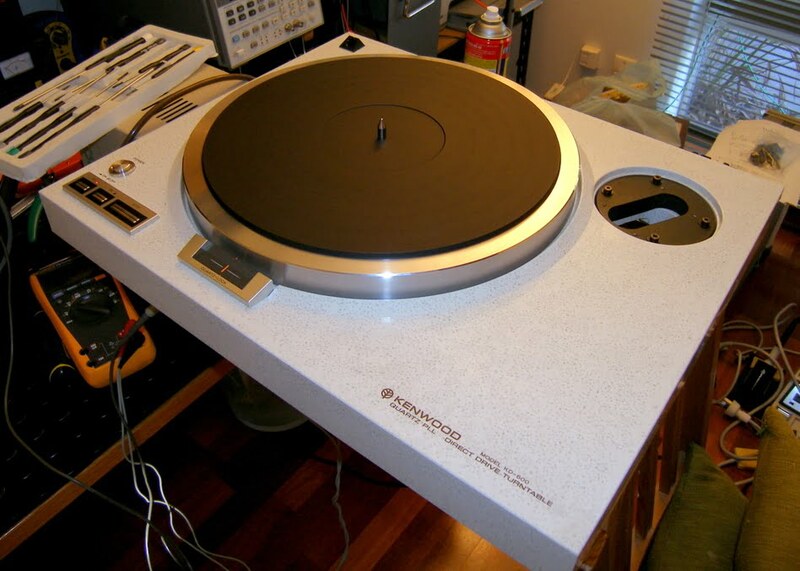 With the extraordinarily high costs needed to set up production, it’s unlikely we will ever see custom materials engineering like this again in turntables. If you look at the featured image at the top of this page, you’ll see the attention to detail in the heavily ribbed under-chassis. All this was designed to dampen and minimise resonance in the deck. The platter on the Kenwood is nice and solid, weighing around 1.5kg. It’s not a heavyweight platter, but the deck weighs around 15kg which these days would put it in the massive category. Rumble is around -70dB and wow and flutter sit at around 0.03%, very good figures even now. You can see a few more pics of the KD-500 at The Vintage Knob. One thing I always do when a Kenwood KD-500 / KD-550 comes in for service is clean and lubricate the bearing and motor. These motors were designed as sealed-for-life units. It turns out though that the folks who designed the deck and wrote the service manual underestimated how long these wonderful turntables would last! These days, unserviced motors are running dry and are very much in need of a fresh dose of synthetic bearing oil. This always makes a deck run more quietly, often more quietly than when new due to improvements in lubricants since the 1970s. Carefully clean the bearing well to remove the oily residue left after 30 years of operation. 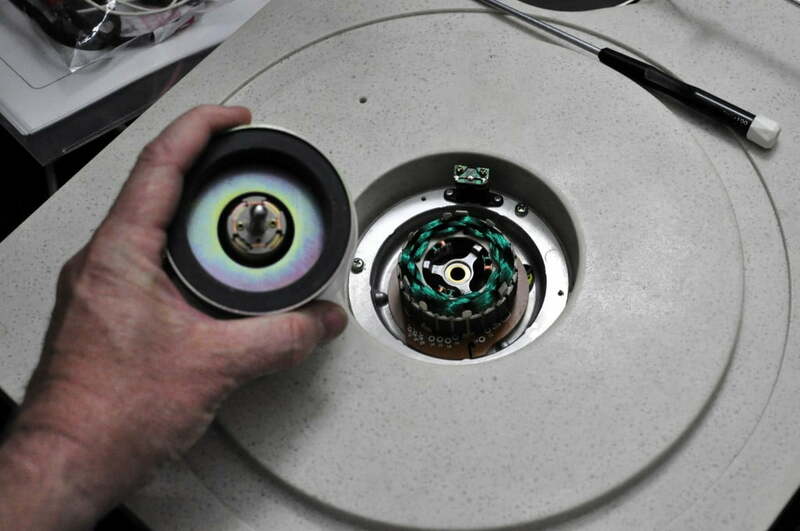 The spindle should be cleaned with a lint-free cloth. 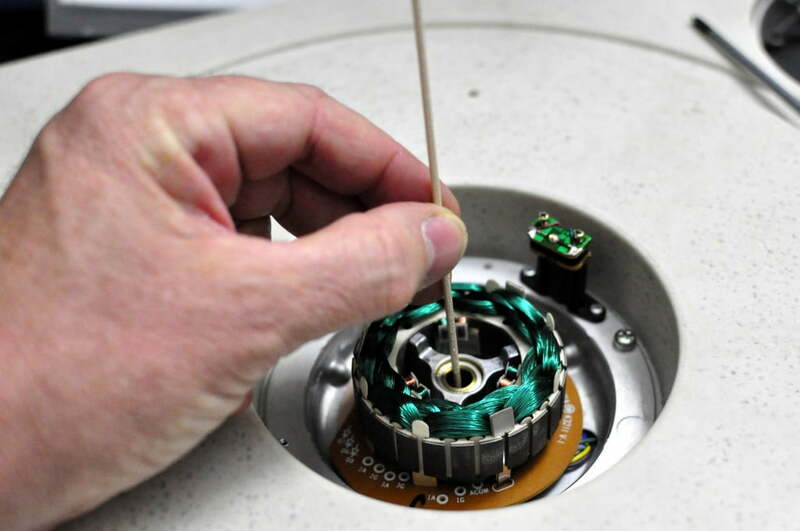 Note the slotted frequency generator (FG) disc attached to the top of the rotor. This passes through the speed sensor mentioned early and together they generate a signal. The frequency of the signal changes with the speed of rotation. The speed servo circuitry senses any deviation from the correct speed and corrects for this. None of the belt-drive decks out there can hope to match the speed accuracy of direct drive decks like these. 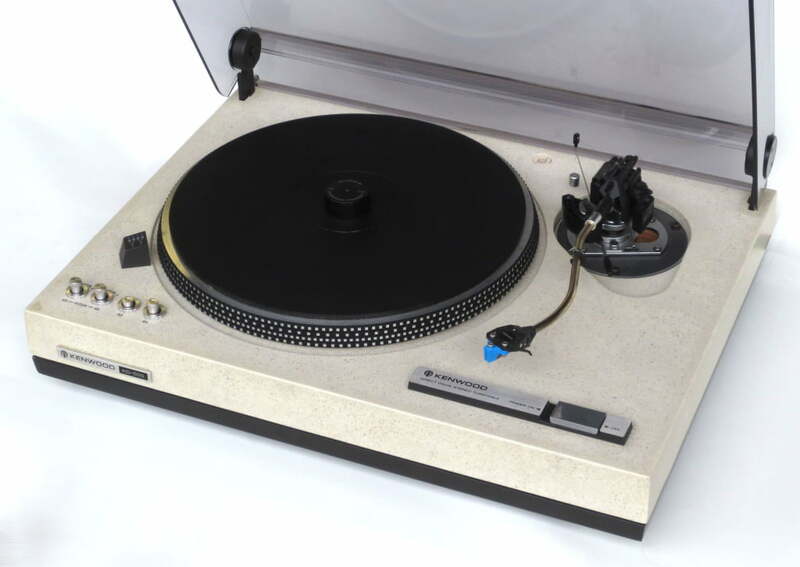 I should also mention the Kenwood KD-600/650 direct-drive turntables. These are even better ARCB decks from Kenwood. I own one of these and it is a superb deck. Mine came with a gorgeous SME Series 3 tonearm. My KD-600, in for service and minus her arm. The servicing procedure is a real pain. You have to get two oscilloscope probes in under the deck, whilst it is running, hence the edge support from underneath! The KD-500 and KD-550 are a delight to use. Being fully manual decks, you get to raise and lower the arm yourself, cueing the lead-in groove and returning the arm to rest at the end of a record. This is proper turntabling and, because it’s manual, nothing interferes with the tonearm and its ability to extract information from the groove. Simple push-buttons select the speed and there’s a handy strobe to help you get that spot on. This is not a quartz-locked deck, rather the speed is referenced to the mains frequency of 50 or 60Hz, depending on where you live. Because of the massive chassis and compliant feet, the deck is pretty well isolated from external noise and vibration. Even so, you should always mount a deck on a dedicated shelf, preferably wall-mounted. This is a very nice sounding turntable. It simply gets out of the way and plays records, exactly what you want and exactly what cheap modern decks find it really hard to do. With a good arm or the Kenwood arm in the KD-550, the bass is deep and controlled. Midrange and treble are smooth and unfatiguing and sound-staging is excellent. Pitch stability is of course also excellent. Just find a good cartridge to match and you’re all set. If you want a manual deck with a huge bang for the buck and cool retro looks, look no further than the Kenwood KD-500 or KD-550. These are excellent decks and certainly one of the best mid-range decks from this period. If you need yours serviced, I look at many of these decks and can quickly and easily get yours running at it’s best. I can recommend, supply and fit a suitable cartridge, and I’m very familiar with all the little tricks needed to get these machines running perfectly. Don’t forget, you’ll find more KD-500/550 articles here. The model is well designed. But it is much similar to Technics SL 1200. Besides, I believe it has some issues with the motor. The motor is not upto the expectation mark and can not maintain accurate speed. Hi Rifat, the KD-500 is quite different from the Technics in many ways actually. There are no issues with the motor that I have encountered and I have serviced many of them. In fact the motor is excellent and maintains very accurate speed! Have a KD-500 that no longer spins accurately fluctuates between 1/2 speed and 3/4 with pitch control turned all the way up. If I follow the procedure above would that fix it or should I be looking to do something else? Hi Jim, I briefly stopped in Santa Fe on my trip from NYC to San Diego, wonderful train trip. I’m not sure what procedure you are referring to but the deck needs service. If you are handy on the tools, you could try opening her up and cleaning the speed controls and associated trim pots on the control board, but there may be other problems causing the speed woes. Perhaps there is someone local you can take it to? Where would you put the KD-3070 in the Kenwood lineup? Hi Hal, certainly not as good a deck. What you really want is a KD-600 or 650 – these are both awesome decks and considerably better than the 500. Regards, Mike. Thanks for your advise. Much appreciated by this ignoramus. I have this notion (probably foolish) to find a Kenwood turntable that will match up in relative performance and cost with my Kenwood KR-A4080 receiver/amplifier. Which Kenwood turntables should I search for? Hi Hal, it’s a good idea to always try to have the very best source components you can afford. If you are looking for a Kenwood then it makes sense to try to find a KD-500/550 or 600/650. You can then keep this as other parts of your setup change. There are other Kenwood decks of course, so much depends on your budget. Regards, Mike. I finally managed to hook a Kenwood KD 3070 turntable to match my Kenwood amp. The unit is in top shape both visually and technically but it needs some attention regarding the too quick arm return even on the lowest speed setting. I understand there is a spinning wheel in an oil pan involved that slows down the arm return motion. I have ordered the 100,000 wt silicone oil that should be in the pan but have no idea how to get the oil into the pan. Is there a procedure that you could recommend? Or perhaps it is obvious once i get under the hood? Hi Lance, I will be selling a suitable oil via my website fairly soon hopefully. Regards, Mike. Great article, great turntable. I recently unboxed mine which had been in storage for 20+ years, hoping it would still work. It did initially, but the strobe indicated it was having a problem keeping a steady speed. Thinking it might “loosen up” with time, I left it running overnight. The next morning I got up and noticed an odor that reminded me of the old adhesive medical tape commonly used years ago. It didn’t have the usual electrically “somethings burning” smell. I realized to my chagrin that the motor was no longer spinning. I have checked the voltages per the schematic (U.S. version with L01-1171-15 transformer) and didn’t find anything amiss as far as I can tell. The output to the motor between terminals 12 and 13 reads 18.3vdc. A quick check of the internet shows part are going to be hard to come by. If it’s the motor, I’m probably the proud owner of a formerly working KD-500 with Grace 707 arm. You seem to be the most knowledgeable person I’ve run across on the subject, but shipping the turntable to and from Australia would probably be cost prohibitive. Any ideas or suggestions? Hi LC, thanks for writing. Unfortunately the only advice I can give here is that someone knowledgable needs to look at the old girl to determine what might be wrong. It could be a case of some dead capacitors after this amount of time without power. They usually need to be reformed, rather than have full mains voltage applied immediately after such a long storage time. Given that she is dead now though, she will need some proper attention, unless you feel capable of removing and replacing all the electrolytic capacitors and seeing if that fixes the issue. Thanks for the reply, Mike. The rotor initially wants to move when I turn the power switch on, but it’s not a sustainable motion. Replacing the capacitors may be do-able if I can find replacements. The situation seems more hopeful if the caps are more likely to be the culprit than a motor that’s died. I see no visible evidence of overheating on any of the components or in the motor. Is there any way to read-out the stator windings and, if so, what values should it read? Thanks in advance. Replacement capacitors are easy to find and definitely the way to go initially. Beyond that, you need test equipment and the knowledge to use it. 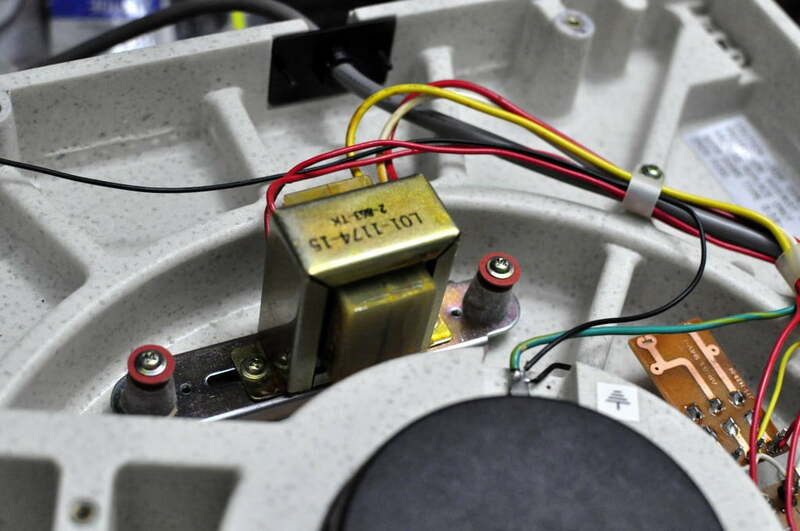 You could test each of the stator windings for continuity, but you might be best to take her in to somebody who fixes electronics in your area and who knows turntables. Pingback: The Legendary Kenwood KD-600 Turntable, Playing Vintage Vinyl! Just bought this Kenwood without arm and cartridge. I want to better my Thorens TD 320. What arm do you advice? Sorry Mike, I live in the Netherlands. Ah, no problem. So you have lots of good options including the legendary SME 3009, the Jelco SA-750D I’ve reviewed elsewhere on my site or even a Rega arm. You’ve just got to make a suitable armboard and you are good to go! I have a KD550 with a stock Kenwood tonearm. What cartridges do you recommend? Hi Johnny, it all depends on your budget, and of course then finding a good, medium to high compliance cartridge within that budget. What ballpark are we talking? Budget is always a hard question for me. I don’t have a lot of money to spend, but I have been pretty lucky buying used gear. I have a Shure v15type4, a Pickering xsv 3000 and a Ortofon 15ff mkii. I guess I want to know if what I have is a good match (it sounds good to me, but maybe it’s because it is all I have heard) or what I should be keeping an eye out for? Hi Johnny, hard question maybe but essential for me to know to be able to advise you! The Ortofon is a very basic cart, I would avoid using that. Likewise the Pickering is not one I favor. The Shure is the best you have mentioned there, but you can of course do better, depending on your budget. It’s also important to consider MM vs MC – again your budget will determine the best way to go here as very cheap MC carts are not worth owning. The key is finding a cart with the right compliance and sound at a price you can afford. Naturally you can do much better than the carts you have mentioned here in both vintage and new, but the Shure, with a good JICO or genuine stylus is a good starting point. A cheap or generic stylus will kill it sonically, so watch out for this. Thanks for taking time time to help me with this. I also have a grado m+ (Uses a silver stylus). If a couple hundred dollars is in my range, is it better to put that money into a better stylus? No problem. The issue is that you’ve got a lot of very basic cartridges here. The problem is that, when you spend say $50 or $100 four or five times on not very good cartridges, you have four not very good cartridges that you’ve spent decent money on! I suggest selling them all and getting something better. Two hundred bucks though doesn’t get you much but, if that’s the limit, sell everything except the Shure and put a decent stylus on it. If you can stretch to an Ortofon 2M Blue which is a little more than $200, this might be a better option. But if you can spend a bit more, you’ll get much better results. I have a KD-500 Bought in the 70’s and put a Magnapan tone arm with MC cartridge. I had a Sota Sapphire TT for a while but sold it, knowing I had the KD-500 in reserve, butI have not ben able to use it in years due to it will not hold speed. A couple of times I have tried to have it serviced and I was told with out a schematic for the electronics I was out of luck. Any ideas? Hi Allan, yes it sounds like it definitely needs a service and some attention. I’d definitely need to have a proper look at her to be able to advise further, but if you are local, I strongly suggest you book her in for an appointment! Regards, Mike. Cartridge recommendations? $100-200 and $2-300 range. Hi Mike, I have actually already written a detailed reply to your query about this a few days ago on the KD-500 / 550 motor service article. Did you perhaps miss that? Thanks for this informative article, it played a large part in my decision to purchase a KD 500 recently. Thus far the only issue I can find with my new deck is that the neon strobe lamp is broken. I thought I’d found a proper replacement part (B30-0117-05) from an online electronics dealer but unfortunately they reached out to me after I’d ordered and let me know it was no longer available. Do you have any specific recommendations for a suitable replacement? Hi David, thanks for writing and I’m glad you found the article helpful. Regarding the neon, I’d need to have an original neon here in order to measure it up and cross reference a suitable replacement. I suggest you do that and try the usual commercial suppliers like Mouser to see what they have. A quick check at Mouser shows around 30+ neon lamps. You’ll need a size and voltage match, so it would be a good idea to measure the voltage across the neon to check that and make sure there is a voltage there and that the neon is in fact dead. I hope this helps! Thanks for the prompt response! Unfortunately I can’t measure the original neon because the glass bulb was broken so that only the two inside elements are sticking out above the plinth. It looks as if someone tried to replace the bulb from above rather than removing the base of the table to access it from underneath and they broke the bulb in the process. Ah well, I’ve used an external strobe set at 60hz to check the platter speed and it appears to be keeping rock solid rpm so at least I’ll still be able to use the table.